It is well known that American automobile manufacturers really dropped the quality ball in the mid-1970s through about 1990. Foreign car makers were gaining increased access to domestic markets with designs that had more efficient engines and transmissions with superior materials and techniques, and corrosion control was much better than most American cars that often began to exhibit rust bubbles underneath the paint within a year or two - particularly in regions where roadways were salted for controlling ice and snow. People (like me) who bought used cars were leery about a vehicle with more than 70k-80k miles on them because it was almost guaranteed that a major engine or transmission repair would not be far off. Foreign cars, buy contrast, were still going strong at 100k miles. If you were there, you know of what I speak. 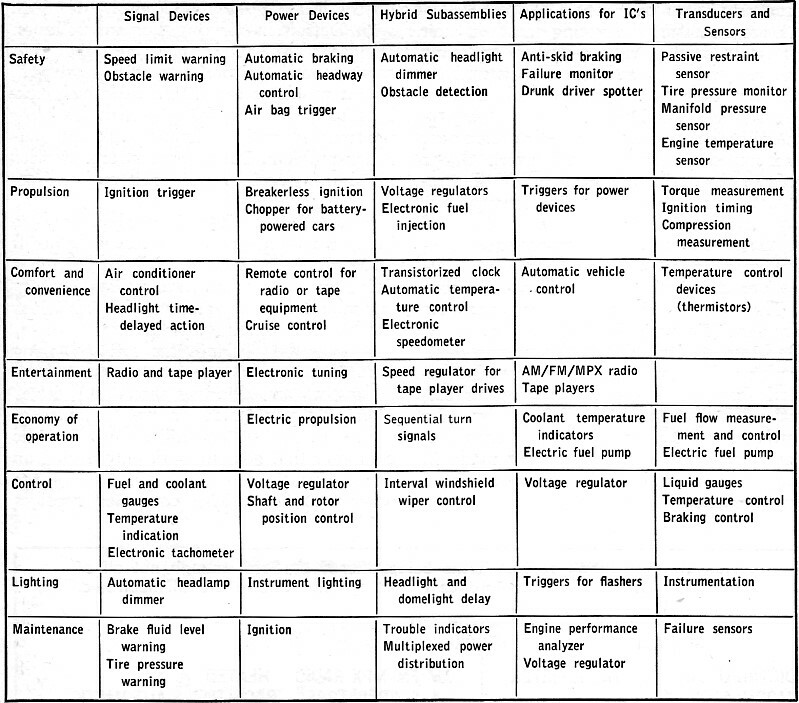 I mention that background to help explain the opening statement in this 1972 article describing what could be expected in the near future with electronics in cars and trucks. A look at the one drawing reveals that by now everything predicted is now standard equipment even on low-end cars, and of course not many people would have predicted GPS navigation, Bluetooth-connected tire air pressure sensors, satellite radio, or even air bags. Chances are that the first car you drive with an on-board minicomputer that starts the engine, optimizes ignition and air/fuel mix, sets safety mechanisms, and gets ready to shift transmission, will come from Japan or Germany. The reason such a car is not likely to come from Detroit is that foreign car firms and electronics companies are cooperating with each other to develop and deliver sophisticated system packages. The picture on the domestic front is quite different; a lack of good communications has put the auto men and electronics men at odds with each other. There is certainly no lack of expertise or ambition in the U.S. The missing ingredients are cooperation and understanding. But with no clear, enthusiastic agreement, solid-state electronics in American-made automobiles has only inched along. It is obvious that any little "blackbox" electronic package integrated into an automobile must be able to outfox and outlast the hostile environments created by rough roads, snow, ice, mud, extreme heat, and extreme cold. Otherwise, the highly practical automobile engineer wants no part of it, according to Charles T. Mulcahy, a Ford Motor Co. Engineer. He goes on to say, "If the engine won't start, the car won't go; if the engine starts and the car is inoperative, the car won't move." But consider this: the little black box has guided man to the moon and back in spectacular form. Solid-state devices contain no inherent wearout mechanisms. In fact, thanks to their proven reliability, solid-state devices and systems are perhaps the only practical and economical way to realize safety, environmental cleanliness, and the convenience required for tomorrow's automobile. The Pressure is On. With enforcers breathing down their necks, the auto makers are necessarily devoting most of their efforts to solving the problem of reducing exhaust emissions and developing passive-restraint devices to comply with Federal regulations. So, Detroit has had to lay aside, at least for the present, development and implementation of such exotic things as a single-wire multiplexed system that replaces the maze-like electrical network wiring harness; radar-based anti-collision and braking systems; central processor to control antiskid braking; electronic fuel injection; and speed and transmission controls. The auto men are furious over this stringent Federal legislation. Ernest S. Starkman, a General Motors vice president, explains that considerable progress has already been made toward reducing air pollution from automobiles. But pressure for further reductions is a consequence of impatience with the progress being made in the state of the air in our urban environments. 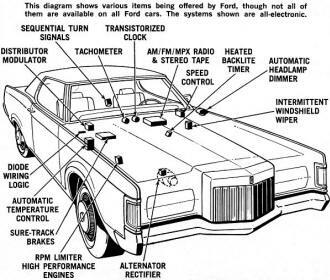 This diagram shows various items being offered by Ford, though not all of them are available on all Ford cars. 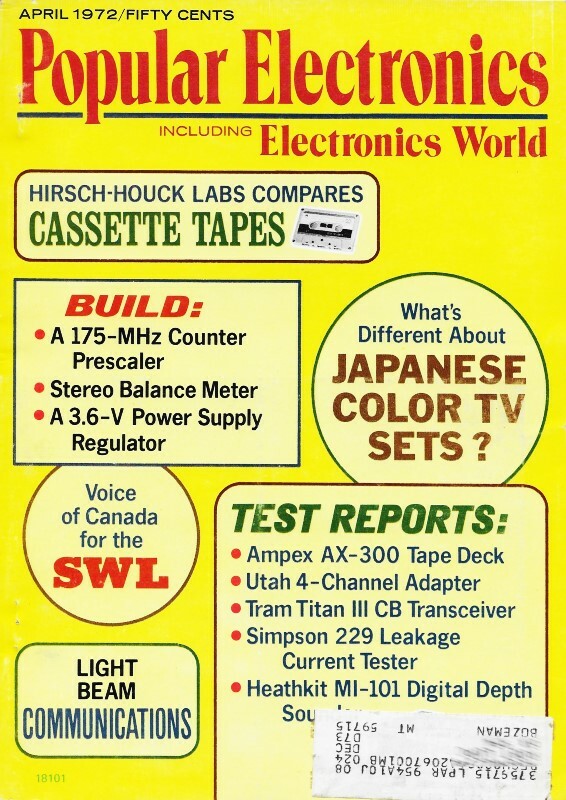 The systems shown are all-electronic. Whatever the impetus, the electronics industry has a golden opportunity to work with Detroit in meeting Federal pollution standards. The electronics men feel that solving both the pollution and passive-restraint problems are within their bailiwick. Presently, however, the auto men are more preoccupied with grappling with the pollution problem. But some electronic devices are showing up in Detroit's new cars. Ford's Better Ideas. 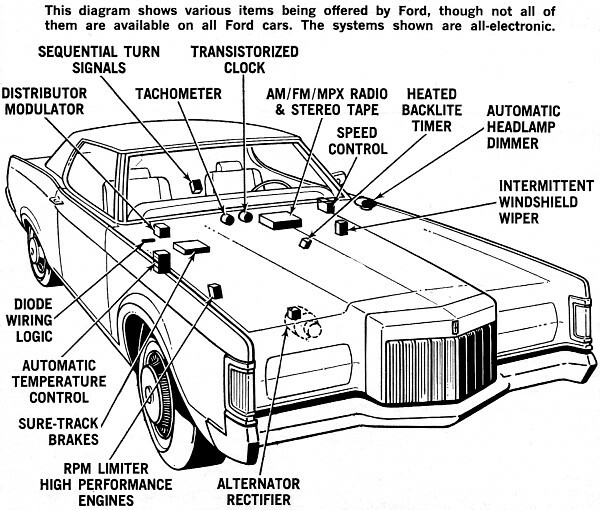 Typical of what is being marketed are the electronic controls in Ford's 1972 line. Not all of the items (see illustration below) are available in any one model. But they are available in various combinations on all Ford-built cars. Among the offerings are safety braking for skid control to prevent the wheels from locking up and skidding should the driver attempt a panic stop on wet, slippery or icy roads. The system utilizes an electronic computer that goes to work only during an emergency situation that could cause the wheels to lock. The computer receives speed information from a wheel sensor through a digital-to-analog (D-A) converter that translates it to a dc voltage before it is fed to a differentiator and data analyzer. The differentiator output is compared with a reference signal representing the coefficient of friction of the road surface from the data analyzer. The comparator output is fed to a logic circuit which determines the amount of braking required and simultaneously activates a power stage which controls braking. Automatic speed control is another offering. Using an electronic memory, this system automatically maintains a constant speed in response to the driver's command. When the car reaches cruising speed, the driver presses a button. The desired speed is then "memorized" and maintained up- and downhill and on the straightaway without the driver having to touch the accelerator. When the brakes are applied, the speed control is automatically deactivated. A number of safety features have been put into the system to meet the industry's standards. For example, a redundant brake-disable feature is available to protect against a defective or poorly adjusted brake switch. Hence, if no disabling signal is received when the brake pedal is depressed, the speed control will automatically disable when the car's speed drops to about 8 miles below the speed that was set into the computer. A distributor modulator is a third offering. Designed primarily as an exhaust control device, the modulator precisely controls spark advance at speeds in the 25-32-mph range, assuring more complete fuel combustion. There is also an rpm limiter available. It is used primarily in Ford cars equipped with high-performance engines and manual transmissions. This over-speed limiter keeps the engine from exceeding a safe maximum rpm limit. Chrysler's Coming Through. Keeping up with their Detroit rivals, the Chrysler people are pushing electronics in their ignition systems, a safety braking system, and automatic temperature control. 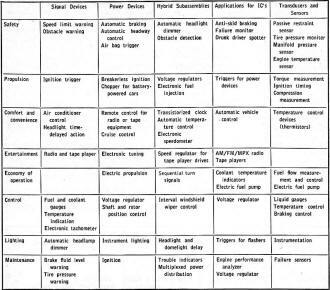 The electronic ignition, which eliminates breaker points, looks pretty much like a conventional system except for a control unit between the distributor and the ignition coil and the addition of a dual ballast resistor. The electronic circuitry is activated by a pickup coil and is used to control a switching transistor that opens and closes the primary circuit of the ignition coil. The great advantage of the breakerless system is lower tune-up cost. 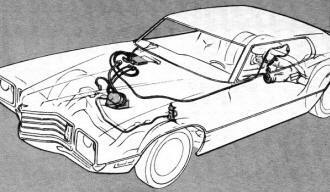 A by-product of the electronic circuitry, claims Chrysler, is that ignition timing and dwell angle are more accurately controlled than would be possible with conventional breaker points. The end result is better exhaust emission control. Like the systems employed by GM and Ford, Chrysler's safety brake relies on a logic computer to activate a pressure modulator to decrease the amount of hydraulic pressure being applied to the brake at the wheel which is about to lock up or skid. Where it differs from the competition is that the Chrysler system prevents front or rear wheel lockup for shorter straight-line stopping distances. It is claimed that the four-wheel safety braking system makes any driver better than an expert driving a standard-equipped car in straight-ahead braking applications. However, as Chrysler engineers are quick to point out, it cannot correct for skids initiated by bad driving, such as when entering a curve too fast. The 1972 Chrysler and Imperial model autos are equipped with a second-generation automatic-temperature control which uses an all-electronic solid-state amplifier to totally control the system's performance. 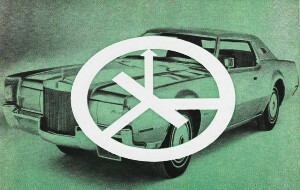 In prior systems, Chrysler employed a combination of vacu-electronic components to automatically adjust temperature. This marks the first time that Chrysler Corp. has used a totally solid-state system employing IC's, transistors, and diodes to control a major system. The Coming Tide. It is obvious from the foregoing that, in spite of foot-dragging and lack of cooperation, some inroads are being made by the electronics industry in Car City. What is also obvious is that, if and when a team effort is finally made, great things are in store for the average American-made automobile. Let us hope that the animosity gap existing between the car makers and the electronics industry narrows soon and creates the friendly conditions needed to bring about cooperation.